Shortly after Nike’s new ad campaign with Colin Kaepernick began airing, the College of the Ozarks in Point Lookout, Missouri, decided to drop the clothing-line as its athletic apparel sponsor. Nike released the full ad campaign, which also features athletes like Serena Williams and LeBron James, on Sept. 6 before the NFL season opener between the Atlanta Falcons and Philadelphia Eagles. 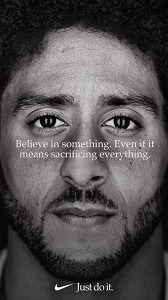 The company decided to make Kaepernick the spokesman in honor of the 30th anniversary of its “Just Do It” ad campaign, according to Bleacher Report. “Nike is free to campaign as it sees fit, as the College is free, and honor-bound by its mission and goals, to ensure that it respects our country and those who truly served and sacrificed,” said Dr. Marci Linson, vice president for patriotic activities and dean of admissions at the College.